Green Gem founder finds purpose in historic Bangor property. The Green Gem wellness center in Bangor sprang from an unplanned encounter, almost as if it had a mind of its own. It’s been only two years since the seed of an idea implanted itself in the mind of Green Gem founder Sandy Fortin, but that seed has already become a young tree with spreading branches. 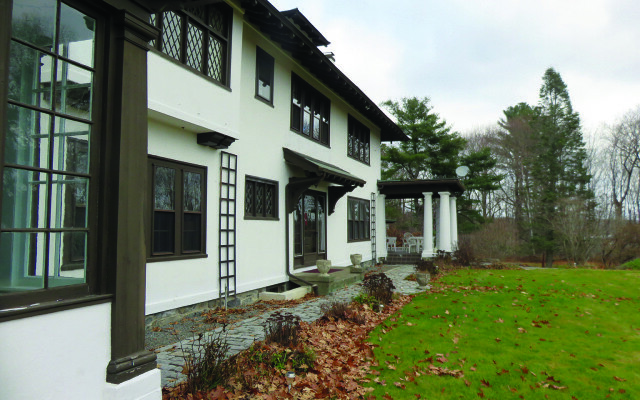 The century-old house and grounds that inspired Fortin’s interest overlooks the Penobscot River from a wooded hillside. Surrounding the building are cultivated garden beds, terraces, historic markers, and a 30-foot long outdoor warming oven. A trail wanders around old forest, with the potential to connect to a hundred acres of green space right in the heart of the city. Formerly a private residence, the property has become something far more complex. In its short life, Green Gem has hosted retreats, wellness days, yoga and meditation classes, two weddings, and more. Several practitioners of healing professions now rent space upstairs to see clients. More recently, historic research on the property has revealed connections to the Penobscot tribe, Hannibal Hamlin, the famous Olmstead Brothers, and Bangor’s first sawmill and outdoor hockey rink. If you ask Fortin how she chose this new endeavor, she’ll say, “I think it chose me.” Fortin was an empty-nester and a student at Husson University in late 2014 when a friend invited her to an open house event at 900 State Street. The owner, a developer named Julie Sites, planned to build condominiums on the property. Fortin drove up the meandering driveway through the bare trees and felt the stirrings of something powerful, undefinable. “I walked into the house and it came over me like a wave,” she said. There was something deeply moving about this old house, the space, the feel of the atmosphere. She explored the three-story building with no diminishing of the profound sensation. Though she’d never met Sites, she approached her boldly. A few days later, Sites called Fortin and asked her to write up a proposal. Fortin was given two months to try out the building as a health and healing center. The first retreat took place in the midst of a whirling December blizzard. “It was a winter wonderland,” said Fortin. Fourteen alternative healthcare practitioners and eight participants shared the warm vibe of the building and brainstormed ideas for a year-round healing retreat center. Green Gem was born. Fortin likes to speak about Green Gem in metaphors: It’s like a big hug from your grandmother. It’s a 5,000-piece puzzle, and you fit a few pieces in each day. It’s a growing thing that needs sound and healthy soil. One might imagine that integrating history, health, land conservation, gardening, and organizational retreats would overwhelm a startup venture, but Fortin is committed to the project in its entirety. Green Gem’s deep links to history surprised her, but she has embraced historic preservation as an essential element to honoring the space.